Eddie Palmieri’s influence on the world of modern music is often celebrated, but just as often underestimated. As he completes his 82nd year with us, his energy and commitment seem to be increasing, as if to fully emphasize the power of not just the music but also the cross-cultural importance of the process. With no sign of slowing, Mr. Palmieri is the elder of a global culture of musicians, actively teaching young students and leading the way for the next generation. 2017 marked the release of Sabiduria, a Latin Jazz masterwork featuring Donald Harrison Jr, Marcus Miller, Alfredo de la Fe, Joe Locke, Johnny Rivero, Ronnie Cuber, and David Spinnoza alongside Mr. Palmieri’s core band of established elders and young guns. 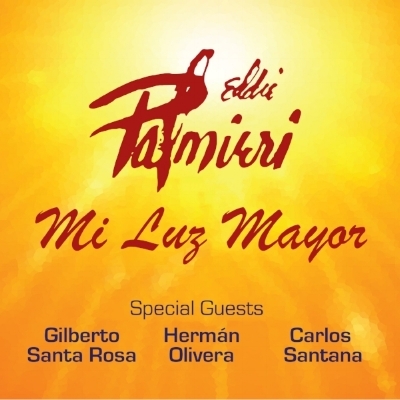 In 2018 Mr. Palmieri returned to his roots in different ways; the summer release of his Salsa classics album Full Circle stunned players and students alike with finely tuned renditions of songs that Mr. Palmieri recorded in the past. The project was also released on the PalmieriSalsaJams App, the world’s first interactive Salsa music app on Christian Scott aTunde Adjuah’s Stretch Music App platform. The App allows students to manipulate and 'remix' all of the tracks, as a practice tool and as an interactive way to understand the arrangements. To further emphasize this extremely prolific time in his life, Eddie Palmieri delivers yet another Salsa classic album - Mi Luz Mayor, set for release in December 2018. A tribute to his late wife, Iraida, Mi Luz Mayor revisits Salsa classics that the pair enjoyed in their youth. From the timeless Azúcar to a searing arrangement and performance of Mi Congo featuring Carlos Santana, the album sets the listener contextually in the era of the great ballrooms with modern performance and production. Some legends become just that; but Mr. Eddie Palmieri is clearly on a mission for perfection in this time. Born in 1936 in New York, Mr. Eddie Palmieri is a bandleader, arranger, and composer who has skillfully fused the rhythm of his Puerto Rican heritage with the complexity of his jazz influences. He gained international attention as a pianist in the 1950’s, playing with Eddie Forrester and the popular Tito Rodriguez Orchestra, among others. In 1961 he formed La Perfecta, featuring an unconventional front line of trombones that created a new sound, mixing American Jazz into Afro-Caribbean rhythms and leading to the trombone-heavy Salsa explosion in the 1970s. Throughout the 60s and 70s Mr. Palmieri continued to surprise fans and critics with his unique sound – in 1970 he released the epic ‘Harlem River Drive’, merging Black and Latin music into a free-form sound that seamlessly blends elements of funk, soul, rock, salsa, and jazz. In 1975 Mr. Palmieri was awarded the very first Grammy for Best Latin Recording; this would be the first of ten Grammys over the next 30 years. His lyrics and arranging style have influenced countless musicians from a diverse array of settings, including Chick Corea, Ruben Blades, Willie Colon and the Fania All Stars, Christian McBride, and hip hop pioneer Bobbito Garcia. Full Circle was released on the new Uprising Music label via Ropeadope on July 20. With fresh renditions of Salsa classics, Full Circle finds Mr. Palmieri teamed with world-class musicians from the New York scene that have played with him over the last decade; Brian Lynch, Conrad Herwig, “Little” Johnny Rivero, Luques Curtis and many more. On Full Circle listeners will hear the basic harmonic and rhythmic structures of the original recordings but with Eddie exploring more freely and aggressively than ever on his solos. These are true representatives of Palmieri at the peak of his creative power. An interactive music player of the Full Circle recording, the PalmieriSalsaJams App (powered by Stretch Music and Spectrum) is sure to please musicians and audiophiles alike. It gives musicians the ability to completely control their practicing, listening and learning experience by customizing the player to fit their specific needs and goals. The app has the capability to mute, solo, pan and fade any instrument chosen along with tempo control, looping and sheet music for each part. Eddie Palmieri once again pushes boundaries by building bridges; between musicians, listeners, and now young students with interactive technology. Full Circle begins yet another chapter in the Palmieri legacy. Eddie Palmieri’s influence on the world of modern music is often celebrated, but just as often underestimated. As he completes his 80th year with us, his energy and commitment seem to be increasing, as if to fully emphasize the power of not just the music but also the cross-cultural importance of the process. With no sign of slowing, Mr. Palmieri is the elder of a global culture of musicians, actively teaching young students and leading the way for the next generation. And now Mr. Palmieri brings to the world his first project since his back to back Grammy wins in 2005/2006 -SABIDURÍA. Sabiduría is the Spanish word for WISDOM, and the message is clear from the outset that wisdom is the exalted value that should guide us all. His intent with Sabiduría, as it has been with all of his recordings, is to create art that will be analyzed and understood well beyond his time. Many elements of style can be found within the experience of SABIDURÍA - funk, soul, jazz and pop are all present alongside the guiding force of rhythm. This is music you can sit to, drive to, and of course, DANCE to. The album features appearances fromDonald Harrison Jr, Marcus Miller, Alfredo de la Fe, Joe Locke, Johnny Rivero,Ronnie Cuber, and David Spinnoza. SABIDURÍA may well be the best Latin Jazz record ever made, and when the dance is over we will let history decide.